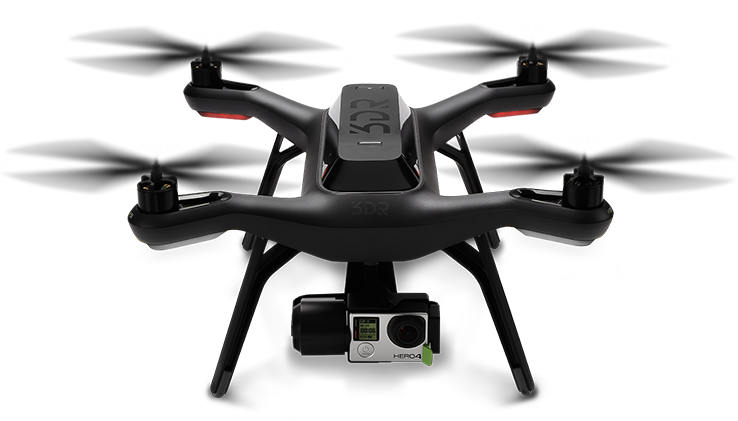 4fly allows you to pilot Parrot Bebop and 3DR drones. 4Fly has a low battery warning system and a tracking system to locate your drone. We can adapt 4Fly for you: agriculture, security and image recognition. 4FLY HAS A LOW BATTERY WARNING WITH AN ESTIMATION OF TIME REQUIRED TO GET HOME, IN ORDER TO AVOID FALLING OR LOSS. Flight mode is allowed in virtual reality. The glasses enable you to rotate the camera and the drone. The glasses enable you to see the image in 3D. Compatible with all models of glasses which work by introducing the Android phone. It allows you to access to different drones, once selected. It has a tracking system in case of loss. It allows you to plan your flights. Available for several types of control. The Samsung glasses do not need any Bluetooth remote or external control. It enables you to access the last coordinates to return home where the drone was. In addition to the coordinates where the drone would go back if lost, showing the route that it would recommend, if you lose the signal. If it runs out of battery, it will stay at an intermediate point of the selected route, displaying it on the map. 4·fly is an app accessible to any user profile, given the clarity and simplicity of its interface and the high performances of its technical development. Select the model to be used from the available list. Select the drone model you have, from the list of detected drones that appear when you are connected to the wireless network. 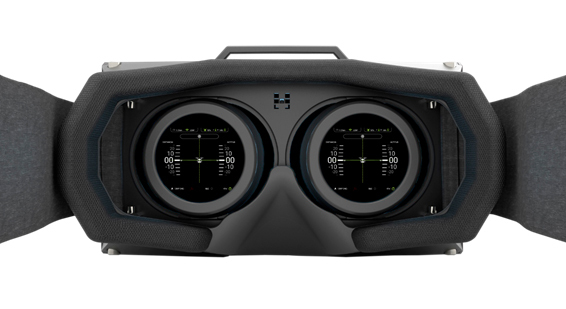 Select the view you want to use:Normal view or VR (Virtual Reality). Device: control via mobile phone. External: via an external remote that comes with the drone. Bluetooth: control via a bluetooth remote connected to the phone. 4·fly allows you to locate the drone in case of loss, since it informs you of the latter date, time and location coordinates of the drone. Moreover, it allows you to create your own flight plans, selecting different points and altitude of the route created. 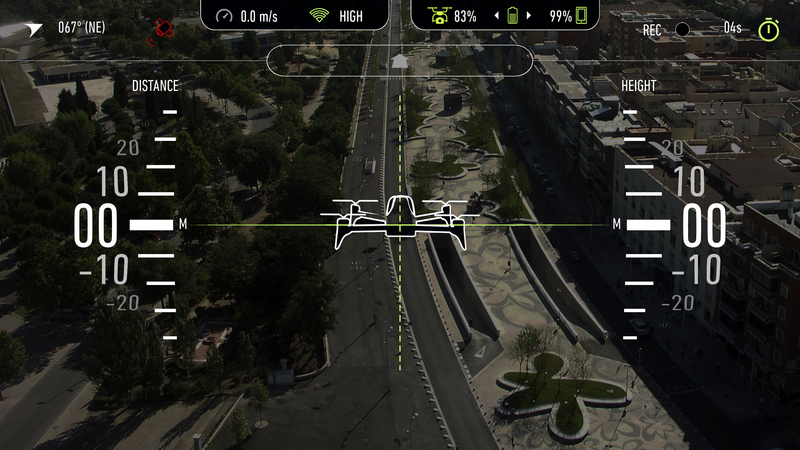 4 fly will enable you to locate the coordinates of the drone on a map, with the purpose of tracking it down. 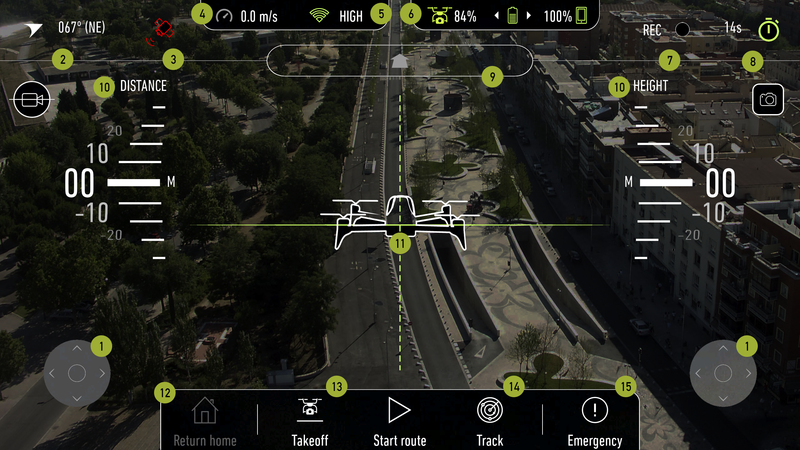 4·FLY is the best option to control your drone from your smarthfone. Simple, versatile and easy to use. According to the flight mode and the type of control you select, our app will show you a different setting of the panel. In total, there are 6 different views. While watching the flight view, you can see the course, GPS status, speed, battery level, altitude and distance, etc. The right control changes the direction, roll and pitch. The left control modifies the power and the yaw. If it flashes red, it means you have no GPS. Yellow flashing, it has less than 5 satellites. Green flashing, it has more than 5 satellites. Grey means “without GPS”. Green means right indication. It changes from green to red as the drone signal disappear. It indicates the remaining % of battery level of the drone and the phone, changing from green to red as the autonomy goes down. It displays the recording status, being active when the circle is red and is flashing. Pressing once to start recording and pressing again to stop recording. It displays the time from when the application boots. By pressing twice it gets rebooted. The ball moves to both sides. If it is grayed out, it will not move and will indicate no available positions. Green indicates that when the drone rotates, the ball is moving and if it focuses, it will aim to the point where it took off. Orange indicates when the drone has lost the GPS signal and it is the last position it had when it had signal. The screen displays the distance to the drone as well as its altitude. It indicates the roll by rotating around itself, the pitch by shifting up and down and the side obeys the lateral displacement of the camera. If a line appears under the drawing, it indicates that it is not possible to take off. If a dotted line appears, it indicates that it is taking off or landing. It enables you to track the drone in case of loss. It leads us to the tracking screen that can also be accessed from the main screen. Depending on the drone model, by pressing twice, the 4 propellers stop. When using external control, side controls and lower buttons will disappear. To begin the control via virtual reality, the mobile phone camera must be turned on first. To use your drone with Samsung VR glasses, you must download an application that disable the automatic startup of the Oculus Samsung app. We recommend “Cardboard For Gear VR”. 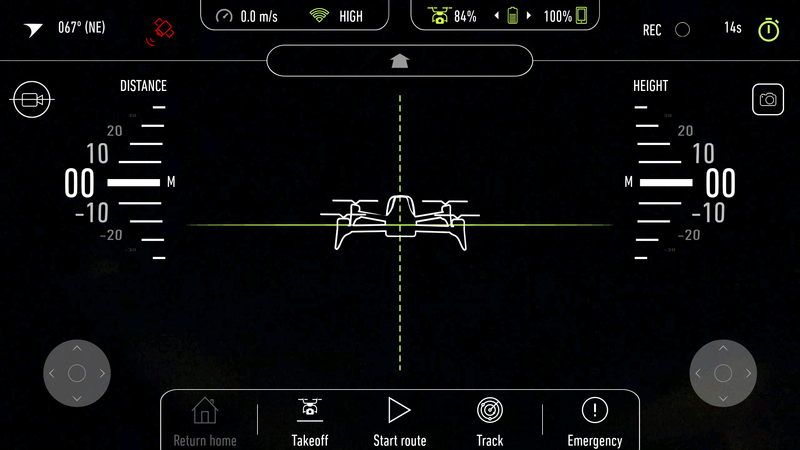 Once installed and configured the application, you will have to connect your drone, starting your flight with VR mode. After this step, place your smartphone in the glasses. The menu is activated by clicking on a button on the external control. There are two options, focus and change camera. If the head is tilted up and down, the camera moves. 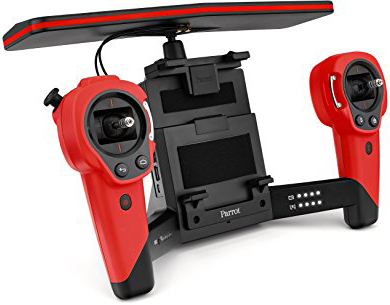 If the head is tilted from right to left, the camera rotates, but not the entire drone. The recording option is not available since it appears in the external control. If the head is tilted up and down, the camera moves. If the head is tilted from right to left, the drone rotates. The handling is pending because it will be configurable. It has a button to go up and down and right and left. It also has a button with the different options. It indicates the distance in meters to the location of the drone. It indicates the direction of the drone. If the arrow and the distance are in grey, there is no GPS signal. If the arrow and the distance are in green, it has GPS signal. The map view changes to the latest images recorded by the drone, as long as they are available. It indicates the latitude and longitude tracked, being able to modify them. Google map. It allows you to enlarge the map and change the map or satellite view. Request more information about our application. You respond as soon as possible. 4 · FLY, the app that lets you control various types of drones from different manufacturers and fly them using virtual reality, in addition to offering the ability to select routes for autonomous flights. Available now in your application download platform. 4·FLY We use own and third party cookies for the analysis of user navigation and improve our services. If you go on surfing, we will consider you accepting its use. Please, check our Cookies policy to check that you are agree with it.